Kramer Electronics presents the K-Touch suite of application software that enables you to design advanced room-control and automation systems and control them via the network using an iOS or Android smartphone or tablet. This user guide describes the K-Touch system and is intended for the System Integrator (Dealer). The End Customer initiates a project relating the design of a controlled room with A/V equipment, peripheral equipment and automation systems. 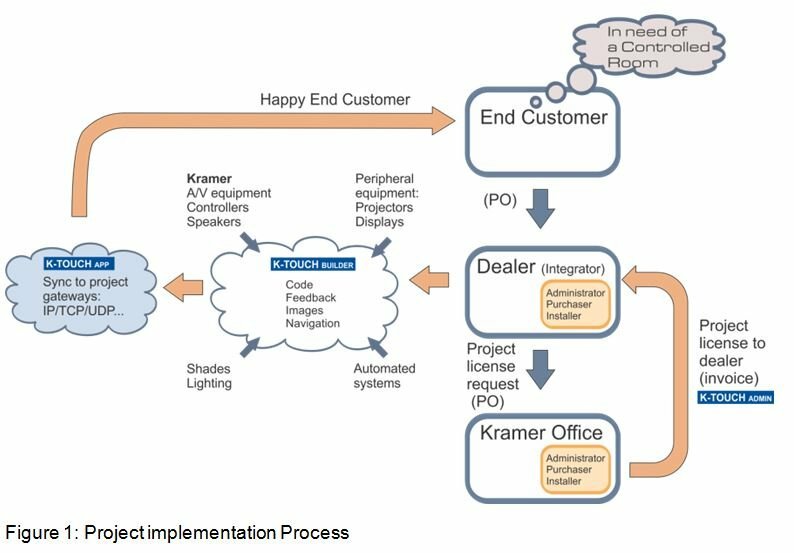 The End Customer contacts a Dealer (the Dealer is the System Integrator (SI)). The Dealer accepts the project and plans the controlled room with Kramer Pro-AV, speakers and control products, peripheral equipment such as projectors and displays, shades and lights control and so on. All the room components will be controlled by K-Touch via a touch panel. The Dealer contacts a Kramer office to place a Purchase Order (PO) for a K-Touch license for this project. Several license types are available, depending on the number of touch screens used and the number of AV controlled devices used. The Kramer office sends an invoice to the Dealer and allocates the cloud-based license for this project. The Dealer uses K-Touch Builder to build the touch screen control. Note that the installer can use K-Touch Builder before or after purchasing the license. K-Touch App is then installed on the touch panel (found in the App Store or in Google Play) and the built project info is synced / downloaded into the App where connectivity gateways are defined for the End Customer.